Companies who manufacture space instrumentation (including satellites themselves) have to subject their products to Prototyping, Flight Qualification, and Flight Verification phases. Before launch, the products must experience space-like temperatures and vacuum levels, and be shown not only to survive the extreme ranges, but also to operate within specification before, during, and after. 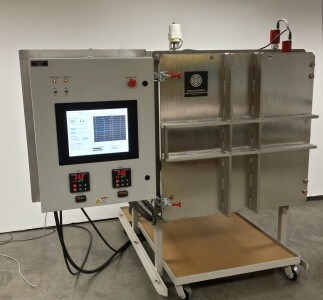 Space Simulation Chambers are key to these tests, and Abbess Instruments of Holliston, is one of the few companies in the world with the capability to manufacture them. Abbess Instruments has a wide portfolio of Space Simulation Test systems capable of simulating a variety of space vacuums (pressures ≤10-4 Torr) … with or without heat and/or cooling. Please refer to our Altitude & Atmosphere Test Systems page for required testing pressures limited to ≥10-4 Torr (altitudes of up to 100,000 ft / 19miles/30km). Our Space Simulation Test Chambers come with or without thermal plates. Satellite Testing Vacuum Systems engineered and built for the satellite industry. These systems can be customized for your desired test procedure. The inner Thermal Shroud can be coated with AeroGlaze® to further improve your testing environment. Abbess Thermal Vacuum and Solar Simulation Chamber Systems are designed and produced for use in laboratory production and testing applications requiring an exposure to or process within a controlled vacuum environment at specific temperature involving solar simulation. Abbess Instruments has a wide portfolio of Test systems capable of simulating a variety of space vacuums … with or without heat and/or cooling. Multi-plate thermal vacuum systems are built to customer specifications, testing requirements, and budget. The Abbess Multimode Thermal Vacuum Chamber System serves as the flexible platform for a range of thermal vacuum testing and experimentation methods. Multimode is cooling using 2 different methods. For altitude testing without thermal components, see our Altitude & Atmosphere Testing Systems. For temperature control systems, see our Thermal Vacuum Chambers.